Go Daddy is a giant industry offering web hosting services. Till now this industry has served more than 52 million domain names. Their services are both competent and reliable. This industry provides some outstanding domain search features. This means that if the domain which you request is not available, Go Daddy can search it and put it in back order for you. You can choose the spiciest and the smallest domain name from the huge domain auction held by it. Because of its continuous growth, Go Daddy is less personal and more commercial minded. Every second and every day, Go Daddy transfers, renews or registers at least one domain name. It is counted as the largest secure website hosting provider in the world. Till date the company has around 10 million customers and the number is increasing day by day. The company offers more than 40 products or services. The services provided by Go Daddy support different programming languages like My SQL, Asp, Perl, PHP, CGI, FrontPage extension, and ColdFusion. It is the highest ICANN-accredited domain registrar in the world. Go Daddy emphasises more on customising its products and this is reason why beginners prefer using it. The official website of the company is godaddy.com. Here, the visitors will find a list of services which the company provides along with their rates. The customers will also find a support system which is open 24 hours of the day and where customers can ask their queries and clear their doubts if any. They can also obtain more information about a particular service from these support forums and helpline numbers. Those who want to purchase some service will have to create an account with the website itself. The official website of Go Daddy also offers numerous deals and plans for the customers. Go Daddy has a remarkable team of members which are highly skilled, experienced and talented. This team includes Bob Parsons as the executive chairman and founder, Warren Adelman as the chief executive officer, Barb Rechterman as the chief marketing officer and senior executive vice president, Christine Jones as general counsel and corporate secretary and executive vice president, Michael Zimmerman as chief financial officer and executive vice president, and Marianne Curran as executive vice president, media and communications. Bob Parson in 1997 started a company named Jomax Technologies and in 1999 he renamed this company as GoDaddy. • It offers a diverse range of products and services including advanced web hosting, website domain, and so on. • It provides an extremely supportive customer service team. • Its products and features are tailored for both the advanced level users and the beginners. • Scalable to all business needs. • Control panel menus are easily navigable. • The services are slightly more costly than other web hosting service providers. • Since the control panels and some web monitoring tools are customised, advance level users often feel tied down. • Users complain of frequent slow connections. • Unlimited plans for web space are extremely costly. The company offers cheap domain registration. Generally all domain extensions are provided to the customers to choose including parking domains, transferring domains, and registering private domains. The company offers both the windows web hosting and linux web hosting. For this, you can opt for any of the unlimited plans provided by Go Daddy. This feature also includes shared web hosting, grid hosting, wordpress hosting, blog hosting, cloud hosting, and so on. This feature is best for those users who require more controls as compared to shared servers but don’t want to spend any extra money on it. The company offers five separate levels of these virtual dedicated servers. These servers are for those who want unlimited control of their web hosting servers. Here, four operating systems are provided to the customers to choose from. 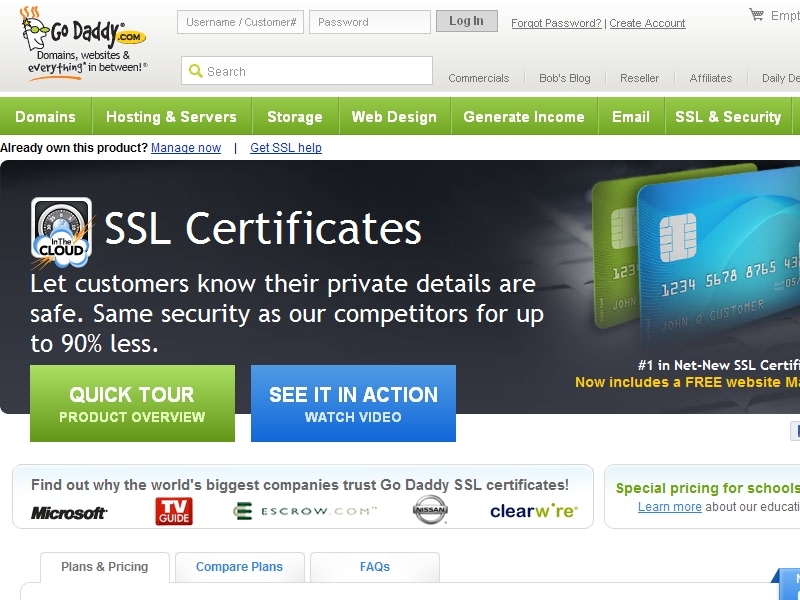 For e-commerce website owners, SSL certificate is very important. Go Daddy’s SSL Certificate will provide an unlimited server and usage cover. These certificates are extremely safe and secure. The performance of Go Daddy is extremely fast in terms of processing speed. The websites take minimum loading time which is both time saving and cost effective. With its latest server technology, Go Daddy provides the fastest server and processing speed. In terms of reliability, no other web hosting company can be as reliable as Go Daddy. It completes your work rapidly without showing error messages or downloading problems. Downloading is very quick, easy, and smooth. The support offered by the company is commendable in terms of billing, email, customer help, community forums, company blogs, frequently asked questions, system status report, and database searching. The customers will have to register with the company’s official website in order to enjoy its services and products. The domain name needs to be registered which includes a numeric address, also called the IP address which the visitors will use to access your website. This domain name is stored in the database of the company which can be accessed through the internet only. When any visitor enters the domain name of your company, the browser uses this directory to find your company’s website address. Once this address is found, your website is displayed on the screen of the person who requested for it. To change or update a domain name, the company takes around eight to ten hours of time to make the changes effective. The company offers three different web hosting plans. The deluxe plan is $6.99 for one month in which the client gets 100 GB space and bandwidth of 1000GB with unlimited domain. The economy plan is for $3.59 for a month in which 250 GB of bandwidth and 5 GB of space are offered. The premium plan is the most expensive plan where 2000 GB of bandwidth and 200 GB of space are offered at $14.99 for one month. Some other packages like dedicated hosting package and VPS are also offered at affordable rates. The biggest competitor of Go Daddy is GreenGeeks. This company also offers same services and products as Go Daddy but at lower rates. Moreover, not all services are included in it. 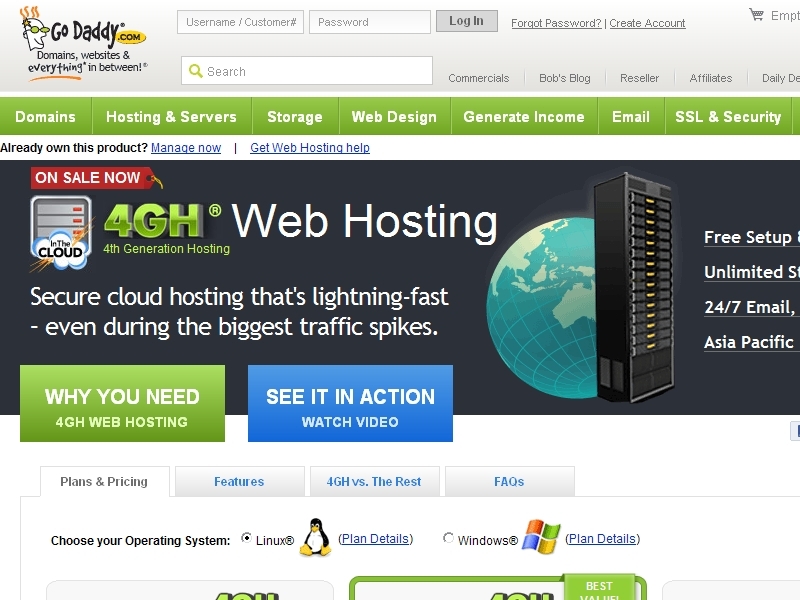 Go Daddy has left its competitors far behind in terms of web hosting services offered by it. Being the world’s best web hosting provider, the company offers a wide range of services which its competitors don’t offer. These services are not only reliable but guaranteed also. Being the top most web hosting and domain registering company of the world, Go Daddy has maintained its position and its customers are increasing day by day. The company provides a wide range of services as well as extensive customer support. Its services are easy to use both for beginners and advanced level clients. Some of its plans may be costly but this point can be ignored when the quality of service is considered. There is no doubt that Go Daddy offers one of the best web hosting services along with user-friendly interface. Its products, services, and plans are worth their cost. It is a guarantee that once the customer opts for a plan, they will not feel that their money has been wasted. You cannot ask for anything more after using the services offered by this company. When your website will be visible to maximum number of visitors and you will do good business, then you will realize the value of the services provided by Go Daddy. Those who are beginners and planning to start with a small website should definitely try Go Daddy for the best results. The company offers numerous GoDaddy Discount Coupons to its customers. The latest discount offered is 15% off on all orders, 70% off on website hosting for .co, free private registration, and many more. Once you become a member of Go Daddy, you will receive regular updates about discount coupons and their offers. 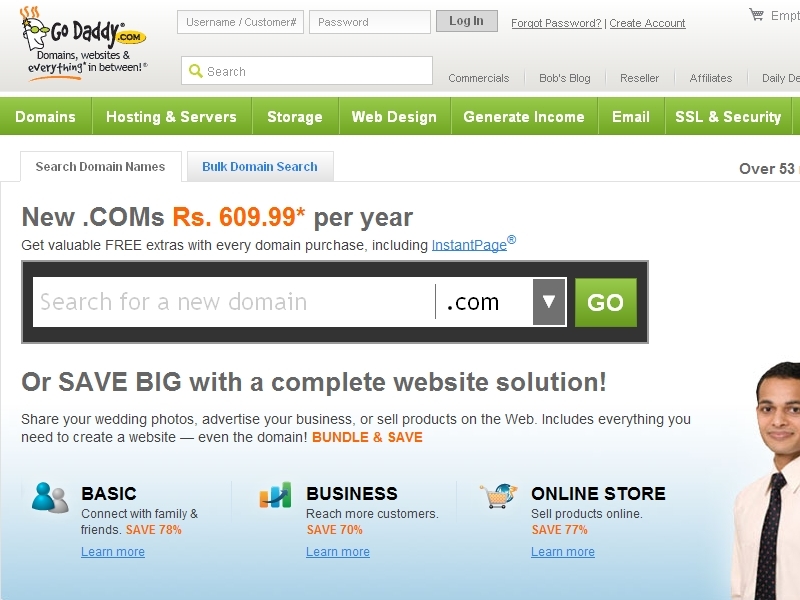 Some coupons with unlimited validity offer 42% discount on .com domain names, 50% off on .net,.org, and. Biz domain names, and so on. These coupons are advertised on the company’s official website as well as on many other related websites.